Contents of LANCOM Wireless ePaper Displays are centrally updated via the LANCOM Wireless ePaper Server. It manages and monitors the access points as well as all licensed LANCOM Wireless ePaper Displays. Thanks to the integrated interface (API), e.g. data for room signage can be transmitted from the calendar management system (Exchange, Domino, Google Calendar, Office 365) to the respective Wireless ePaper Displays. LANCOM Wireless ePaper Displays can be flexibly designed depending on your needs. Illustrative exemplary images and calendar templates are included; proprietary designs can be uploaded just as easily. 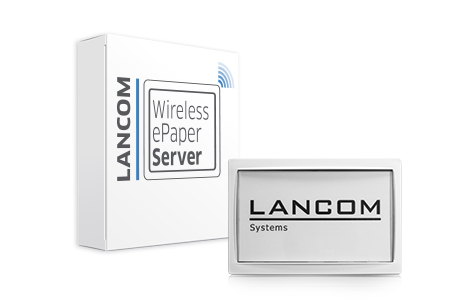 The LANCOM Wireless ePaper Server is part of our innovative Wireless ePaper solutions. * Free further development possible thanks to existing API.